Rock Band, the almost now default party game. Almost all gamers have a least one iteration of this rhythm game. Sure it has been made mobile in the past. Rock Band on the DS, on the iPhone and whatever else it has been on, but these system have a flaw in them. They remove what some believe makes Rock Band great, playing with friends. Thanks to the new 4G LTE network that Verizon has launched though that may very well change. 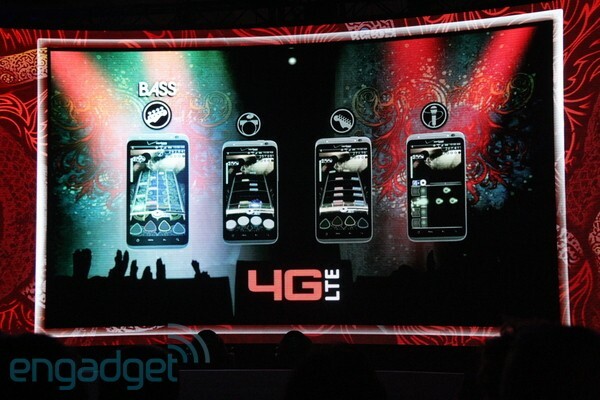 They are planning on allowing 4 people to play Rock Band over their new network on a LTE Android device. The only thing I worry about on this is how much data that can cost over a time period. Click the source links to check out the full press release. This picture is from Engadget, like you could not tell.